The Mayhew Levee is located along American River in Sacramento, and is in place to protect the neighborhood to the south. 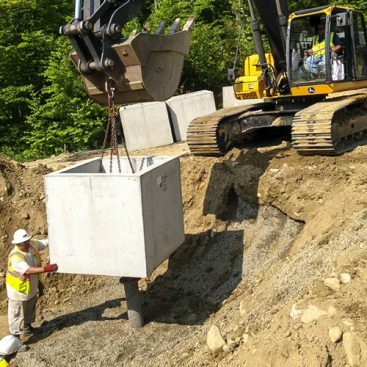 The Mayhew Levee Raising and Drain project is designed to improve and increase the capacity of the levee and to replace the Mayhew Drain structure at the west end of this reach of levee. The Mayhew Levee portion of the project included the installation of a slurry wall within the existing levee as well as the raising and widening of the levee by the Prime Contractor. The Mayhew Drain portion project consisted of installing slurry wall under a slough that drains storm water into the American River. In a future phase, FCI will install storm water/flood control gates on top of this slurry wall within the existing storm water drain. The new slurry wall tied into an existing slurry wall previously installed on the west side of the Drain, and to the Levee slurry wall installed under this contract. The Mayhew Drain section was approximately 143 feet long and a total of 8,200 vertical square feet (VSF). The Mayhew Levee section was approximately 4300 feet long and 220,000 VSF, with depths up to 70 feet from the work platform. Geo-Solutions installed the slurry wall to pre-determined depths as designed by the USACE. Geo-Solutions was required to have a Geologist on site at all times to log the material and verify the low permeability layer at the design depths. The soil layers included the well-compacted levee material, poorly graded sand layers, a cobble layer up to 40 feet thick, and a sandy clay/clayey sand material, which was the key layer. The backfill for the project was created using a pugmill mixing plant. This project is believed to be the first slurry wall constructed using a pugmill for mixing the Soil-Cement-Bentonite backfill. The backfill was mixed at a fixed plant location along the waterside toe of levee. The pugmill plant included an aggregate feed belt with a belt scale, a dry bentonite silo and feed belt with a scale and variable speed drive, and a slurried cement mix tank with a mass-flow meter and variable speed pump, all of which feed the material into the pugmill mix chamber. The material feed systems were computer controlled at the pugmill operator’s control trailer. The excavated material was trucked to the plant, and the mixed backfill was trucked back to the slurry trench using off-road dump trucks. 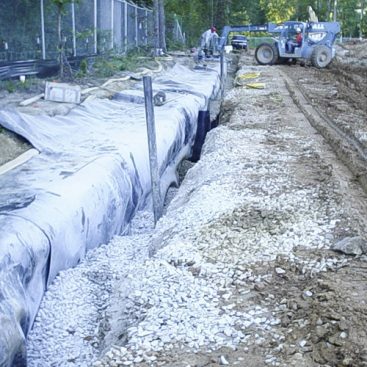 The project specifications required the slurry wall backfill to have a permeability of 5×10-7 cm/sec or lower, and have strength of 50-300 psi. The backfill was mixed using primarily the soil excavated from the trench and some imported material. The trench spoils were screened at the pugmill plant to smaller than 3” material prior to placing in the pugmill aggregate hopper. The project specifications also called for a maximum sand content in the trench slurry of 15%. Full time de-sanding effort was required to meet this specification. 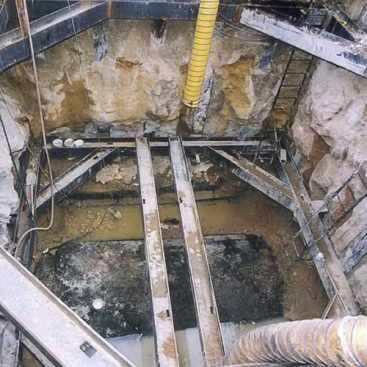 A complex slurry de-sanding rig was used on the site which included a hydraulic submersible pump, a primary scalping screen, multiple hydrocyclones, and a secondary scalping screen. The de-sanding rig was self-contained and moved on the levee crest behind the trench excavation equipment. A key challenge on the project was access. 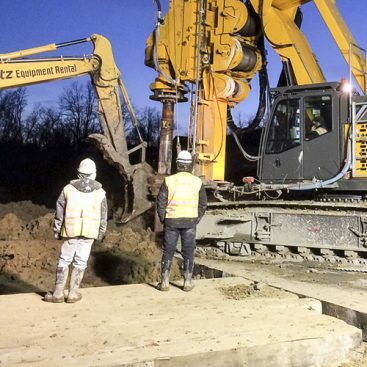 The centerline of the trench was approximately 10’ from the water side of the levee, leaving approximately 15’ on the land side for delivery of the SCB backfill. The levee was also the only access for material and equipment to the plant area. Geo-Solutions used a Komatsu PC1250 with our custom long reach boom and stick to excavate the slurry trench.